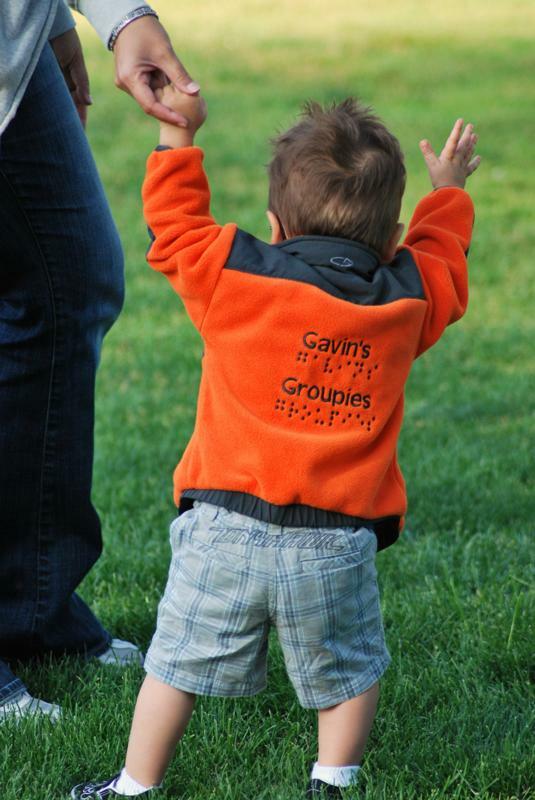 Gavin's Groupies in Full Force! We wint to dor to dor to get plejis. this muney is for Gavin. he is a crasye mokye. i like to rid my bike. "We went door to door to get pledges. 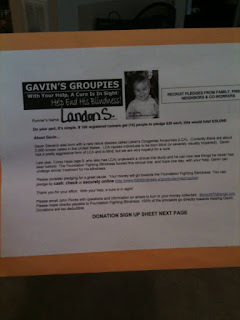 This money is for Gavin. He is a crazy monkey. I like to ride my bike." 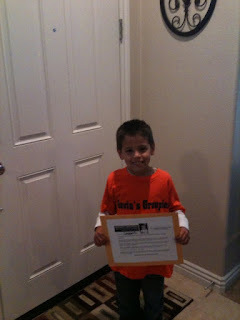 Landon was so excited to go door to door in our neighborhood and get pledges for VisionWalk. He was happy to have raised $120 in just about 45 minutes! 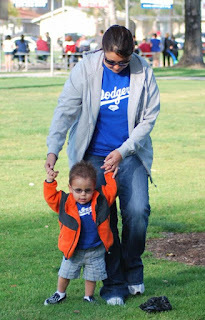 We will be doing this every weekend until the VisionWalk. I made him a sheet of how much raised and what his goal is, so he can get an understanding of how hard everyone works to raise money for his brother. 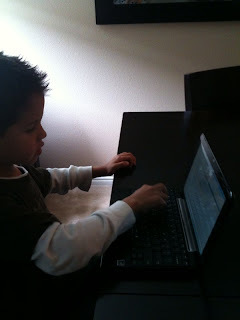 Typing away his first sentence. 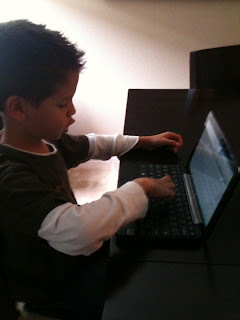 Mom's first guest blogger. 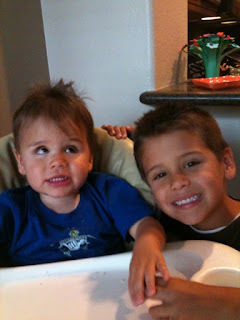 Because his brother Gavin really IS crazy. Poor Landon trying to pose and Gavin swoops in with the chompers and bites his fingers. As if the bite wasn't enough, he has to go in with the head push. 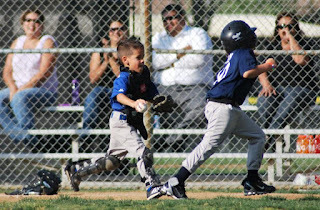 Hurry Landon, quick. Sneak in there so I can take a picture. Thank you Landon Troy Stevens for your first guest blog entry. Hope you will join us again soon. Yes I know I can't seem to stop talking about gene therapy, but it is the pioneering it's way through the arena of treating blindness. How can I not talk about something so exciting. Below is what I got off the FFB website. There are a lot of links out there with explaining how this works, but this was a pretty straight forward, not overly scientific type of explanation that will just confuse you. It does get pretty complex! Virtually every cell in your body carries a complete set of an estimated 20,000 to 25,000 genes. Genes instruct cells which proteins to make, and these proteins are essential to the health and functioning of all your cells. Most inherited retinal degenerative diseases are caused by a small variation (mutation) in a single gene. These variations are like small misspellings in an instruction manual. Even a small misspelling can cause the wrong protein or wrong amount of protein to be made. That can lead to serious consequences like degeneration of the retinal cells that enable you to see. Scientists are developing gene therapies to deliver a new, corrective gene to the retina, so cells make the right proteins, and stay healthy and functioning properly. Man-made therapeutic viruses are one way to deliver the corrective gene to the cells. The viruses are said to “transfect” — or penetrate — the cells with their healthy genetic cargo. Gene therapy is administered by injecting a tiny drop of solution — which contains the virus and new gene — underneath the retina. The solution is absorbed into the retina over a period of hours. The elegance of gene therapy is that one treatment can potentially be effective for several years or perhaps a lifetime. Now that that is explained, there was a new article that was emailed to me. There is a new oral type of medication that has had promising results so far. From what I know everything so far, in a clinical setting has been given via a shot injection into the retina. The link is here for further reading, It showed the younger the patients (in clinical trial settings) the better seemed the results. Future trials will include those who have the RPE65 gene. Upon this discovery, is the hope they can apply learning, findings and conclusions towards the other genes that cause LCA. This gets complex, but they are pretty much focusing on the one gene (RPE65) in clinical trials. We are still awaiting our blood results from the Carver Lab, but I do not think Gavin has the RPE65 gene, based only on the characteristics I have read. Do you see our urgency with trying to raise money, awareness, etc? 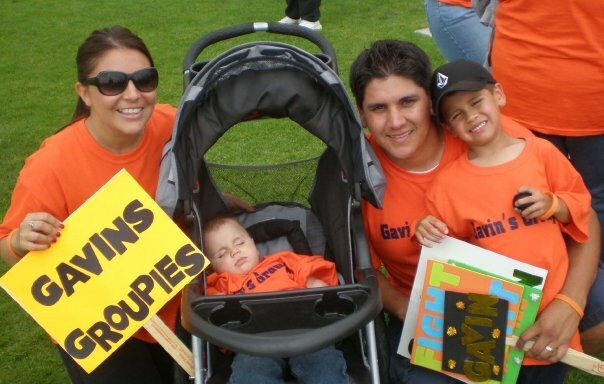 We are on the brink of a breakthrough, and this is happening during Gavin's lifetime. It's happening today. It's already happened to other children. Vision HAS been restored. How crazy is that?! I cannot sit back and not be an active part of this. Just by little ol' me in the little ol' cow town city of Chino raising some money and awareness while we are at it - is us being a part of it. It may not be huge, but it all starts somewhere, and we will keep marching on and trying to get any way possible for people to remember us and our mission. That mission being raising awarenss and money. Bottom line. He is still a baby (ok a toddler). This is the time to be passionate, and I couldn't be in a better position. 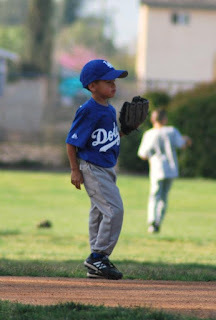 I am a passionate person by nature, I am a "do'er" and think everyone should play an active role in life, and I have always wanted to help people, and my drive is my son. That equals perfect combination. This leads me to say it is still not too late to walk with us or donate! 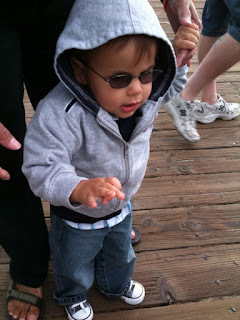 VisionWalk is in a few weeks! Even a $10 donation will bring us closer to our goal. Like how I throw that in there? I'm getting sneaky. :) Help this little guy out. Help us get him out of the darkness. 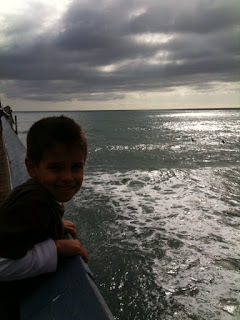 Gavin, Mother's Day in San Clemente. 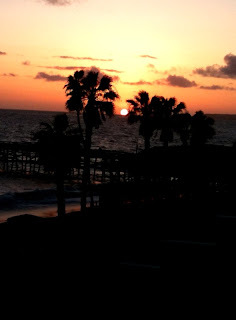 First time on a pier. 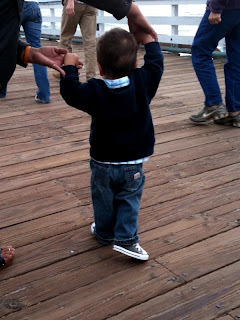 He liked hearing his little feet hit the wood planks. 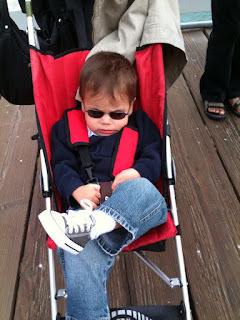 Here he was relaxing waiting for our turn to eat at The Fisherman's on the San Clement pier. 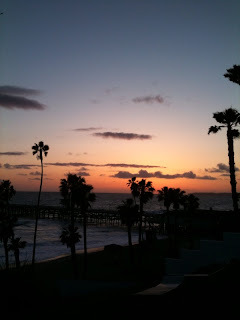 He loved hearing the waves crash beneath him, and walking in the sand after dinner. I'm a sucker for a beautiful sunset and some gorgeous clouds. Trees and clouds are my favorite. This is an idyllic photo for me. I take time to explain to Landon how appreciative he should be to be able to visually see all these gorgeous things his little brother can't. 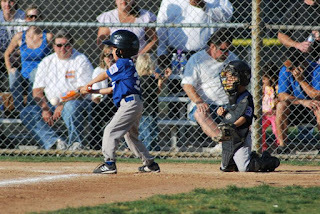 At 6 years old, he gets it. 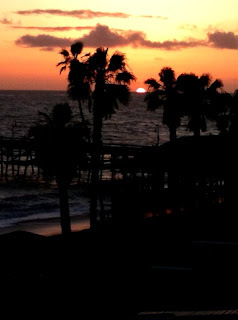 We watched the sun completely set, until it disappeared. 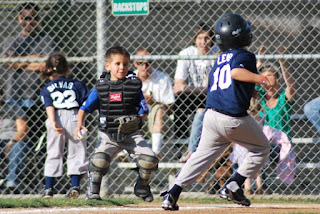 Once it was completely out of sight, Landon jumped up looking the opposite direction for the moon. It was pretty cute. I held Gavin and explained it all. 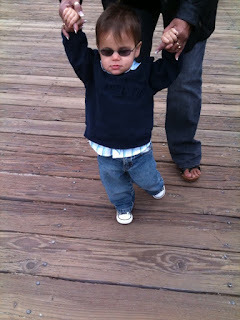 He had his hands up the whole time, feeling the cool ocean breeze. He loved the ocean, and we will be making more trips to the beach this summer. This is why my family does what we do. We have to do our part. Even if it's just a little. In time, little things may one day be big things. Right? One day gene therapy may help him and many others to be able to visually see this. 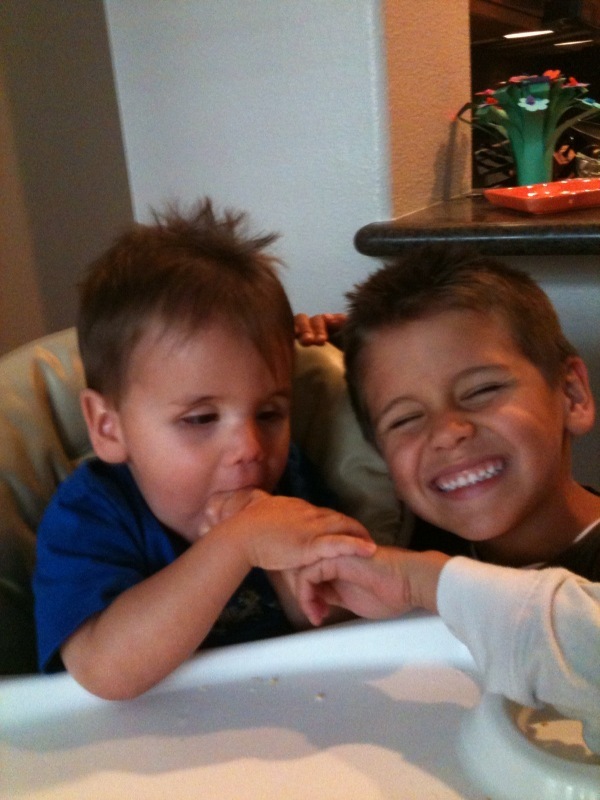 Seriously, can anything get any cuter than this? 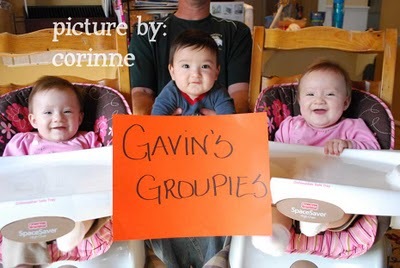 Triplets holding up a Gavin's Groupies sign to show support of this year's VisionWalk. I completely melted when I saw the picture. Thank you Stevens family (yes, they are Stevens also) for sharing your little ones in support of Gavin! Corinne put this picture along with a post about VisionWalk to encourage people to visit her fundraising page on her personal blog. It's working! 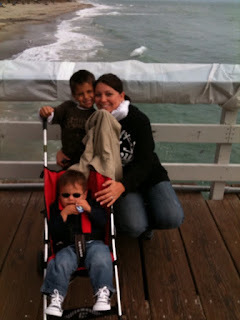 Thank you Corinne and family for supporting us! I often talk about gene replacement therapy. This is another inspirational video. Yes, they are working on one specific gene of LCA, but who knows when that can research can completely open the doors to all genes that cause LCA. This is what we as a family, work so hard for. This is why we do our events, why we have our website, why we raise money and awareness, why we research and try to connect with others. It's completely mind-blowing with what science has come to, to be able to be so close to cure blindness. It's been done in clinical trials! I'm confident this will help so many individuals out there. It really hit home when Dr Jean Bennett mentions she still cries when she sees Corey today. Dr. Bennett and I have exchanged emails, and I feel her passion come through her emails. I am proud to be in contact with people I have met along this crazy and wild journey! that comes from having the melody be my sight. No, really... hold the applause. 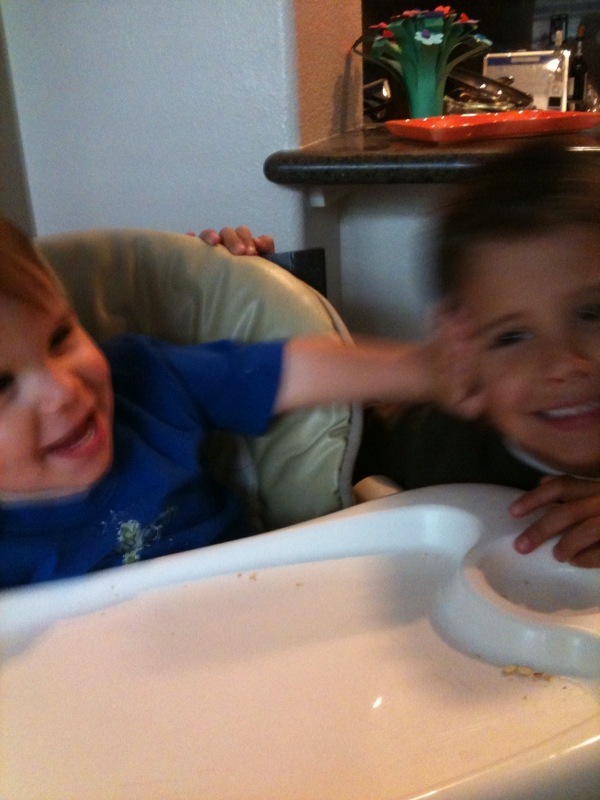 Gavin takes little 'lessons' here and there. 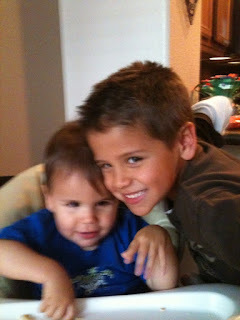 Not structured like Landon's, but he loves it and never wants to leave when 'lessons' are over. His piano teacher is learning braille, so he can help him read music when the time comes. I hear music differently now because of him. I have said this before, but music and Gavin are a match made in heaven. He recites lyrics after hearing them once, sometimes twice. He will hum the song right back to you. His world stops when he hears music, and is taking in the melody. 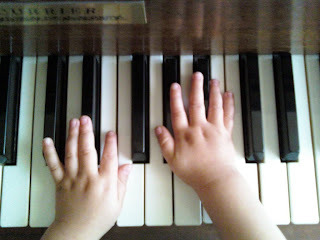 I am in awe of this little guy when it comes to his 'usikkk' (music). ... and waiting for a ball hit up the middle. 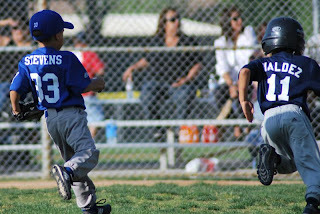 ... then chasing 'em down at home. But only "alk" with two hands positioned just right. Don't trick me mom, you let go of one hand, and I stop! I know your trick. 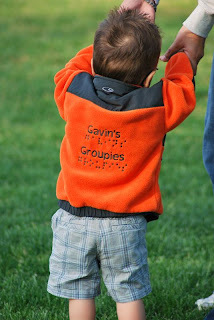 But don't you just love my Gavin's Groupies braille sweatshirt? Don't mind my flat, bad hair day -- I just woke up, and wanted to alkkkk. Gavin's wanting to "alk" and asks to "alk" 1,098 times a day. He's getting more comfortable, and I'm so proud of him. He's been cruising around furniture for a few months, and now is ready to "alk" holding your fingers just right. 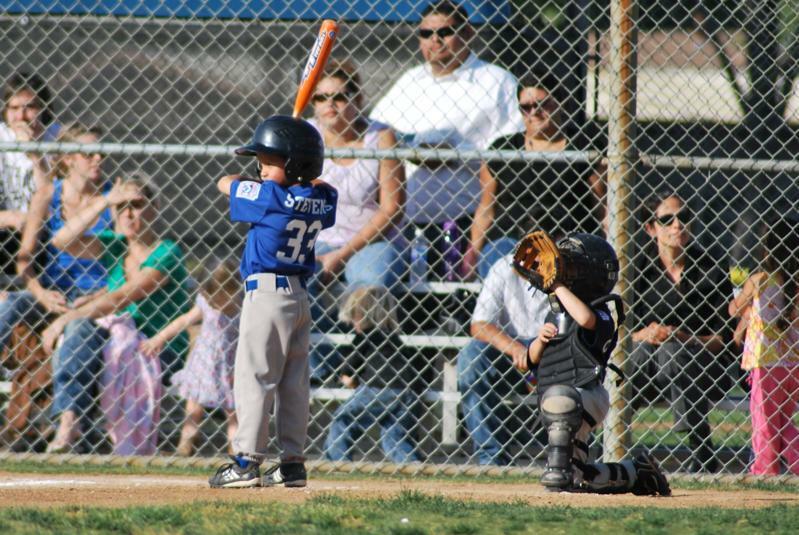 I'm sure we will be in this phase for a while, but he's getting more and more comfortable and he makes me so proud! He is 18 months now, and still not crawling, which isn't surprising. Many of the other mommy's I've talked to with VI babies, skip crawling. His walking is a delay to the blindness. Close your eyes and try taking a few steps. Scary for us, and we have a point of reference. Gavin doesn't. He doesn't understand his place in space -- but he's getting there. 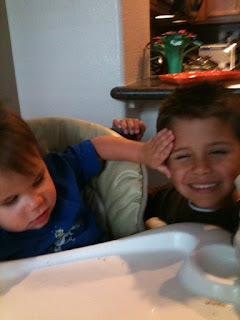 At least when we "alk" he keeps his hands out of his eyes. So I will trade that battle in for my sore, burning, aching, feel-like-my-back-is-on-fire and-I-can't-move-at-night, any day! Keep going monkey -- you're doing good!